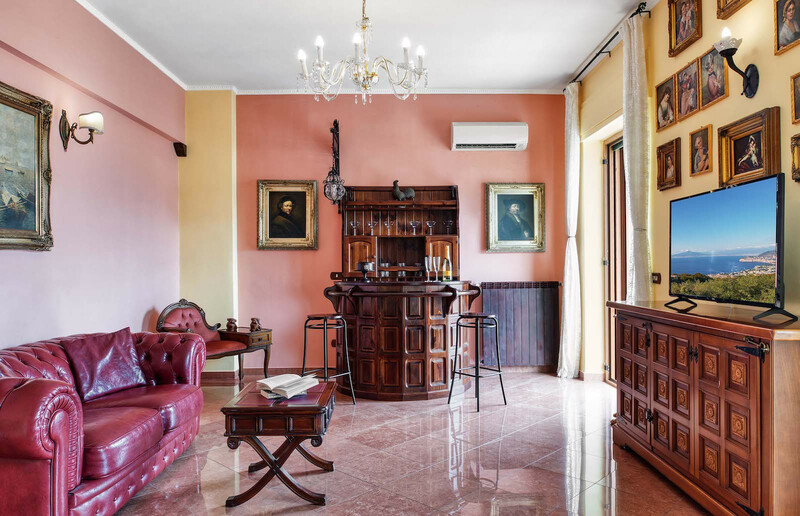 La Musica is a unique apartment, right in the heart of Sorrento by Piazza Lauro, and convenient for all sightseeing. 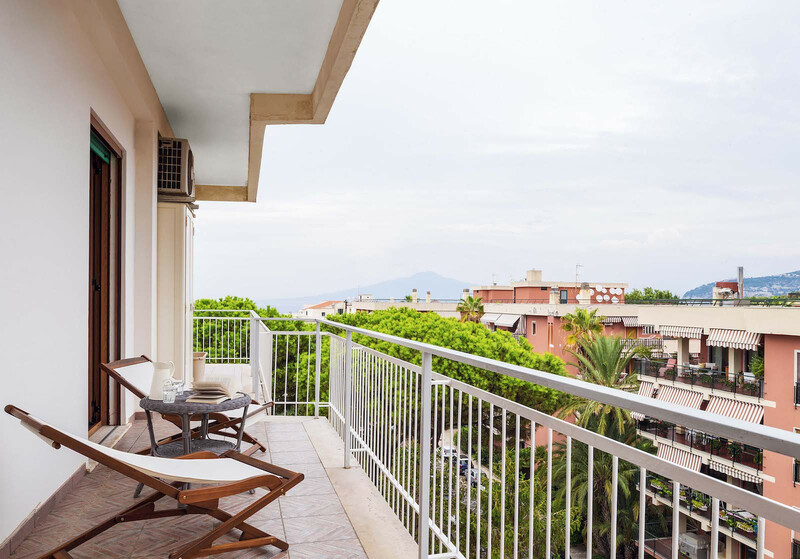 The apartment has an enviable position on the 5th floor, with balconies offering unmissable views across the rooftops to the sea. Access to the apartment is via a lift. 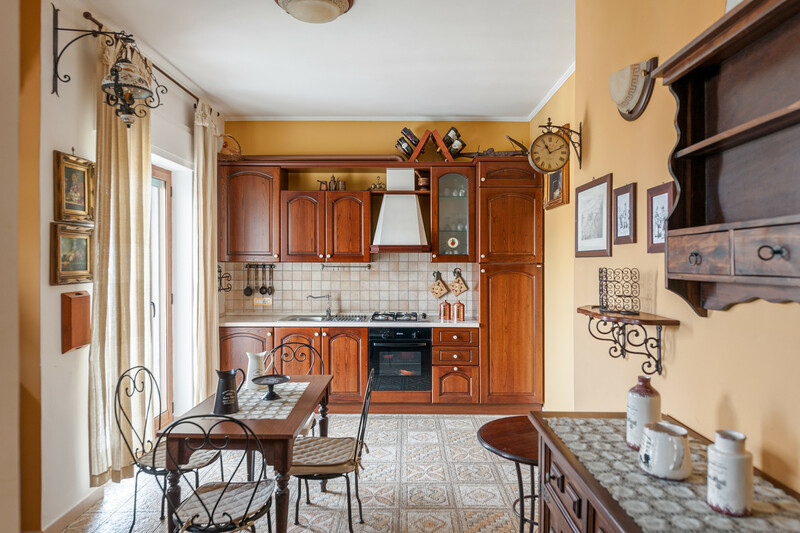 Upon entering, you will immediately feel the special atmosphere of this apartment. Every furnishing and design choice has been carefully made. 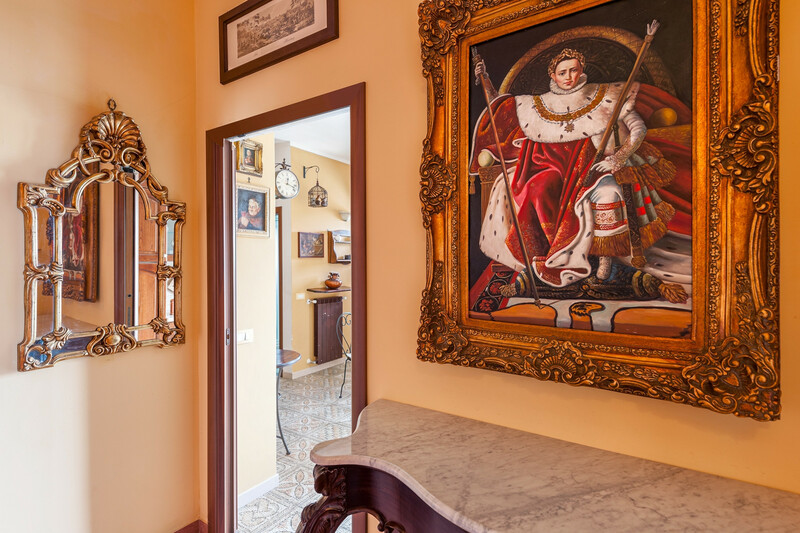 There are many charming original features, perfectly framed by the muted tones of clay and ochre on the walls. 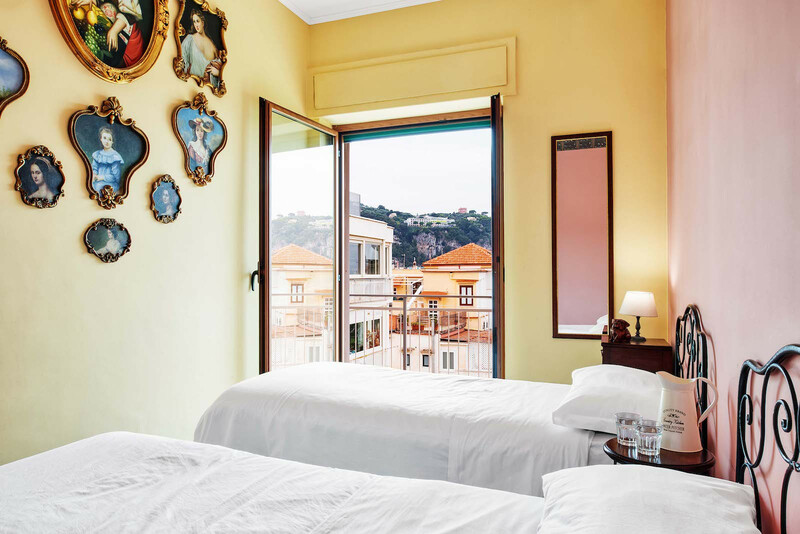 Paintings on the walls celebrate the glories of Italian art, alongside luxurious touches, such as marble-topped tables, gilt framed mirrors and station-style hanging wall clocks. 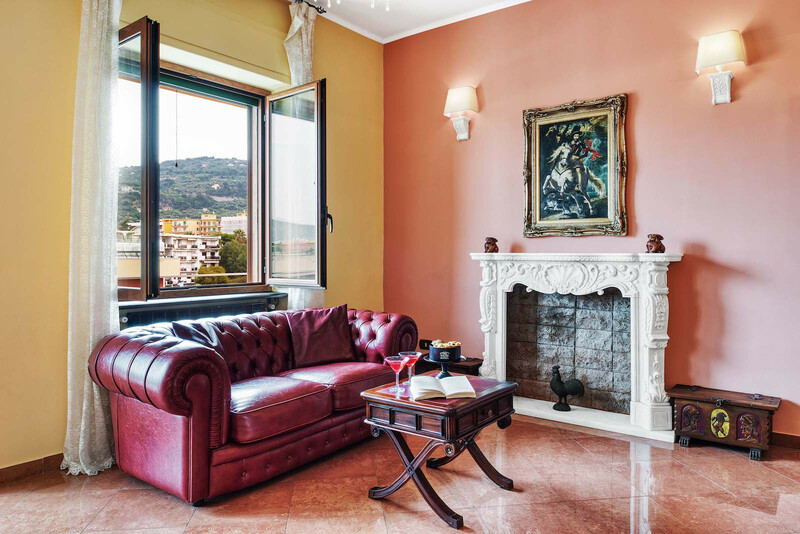 There is a central living room, with a comfortable red leather sofa and television. Relax before the ornate white fireplace, or why not serve yourself a drink from the fabulous wood panelled bar? There is air conditioning in the living room for your comfort. 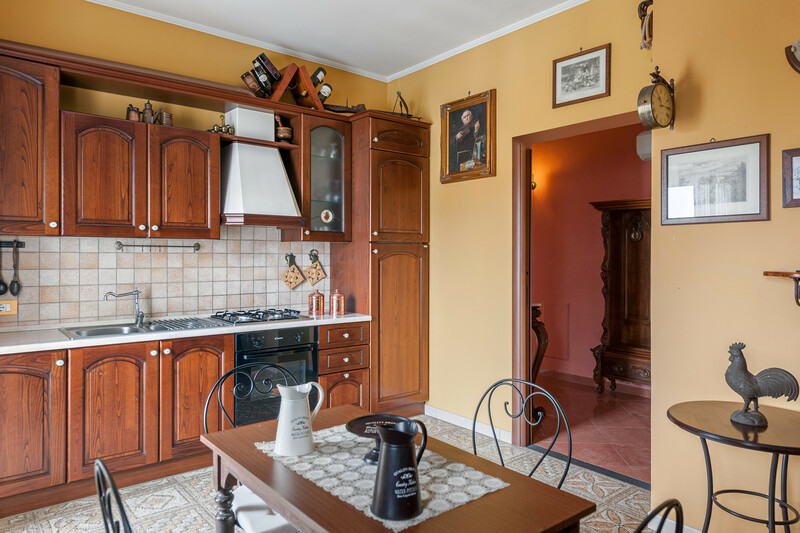 The kitchen has dark wood units and everything you need to rustle up a meal, including an oven, gas hob, dishwasher and fridge freezer, plus a dining table and chairs. A washing machine is also available. Double doors lead from the kitchen onto the wonderful balcony. 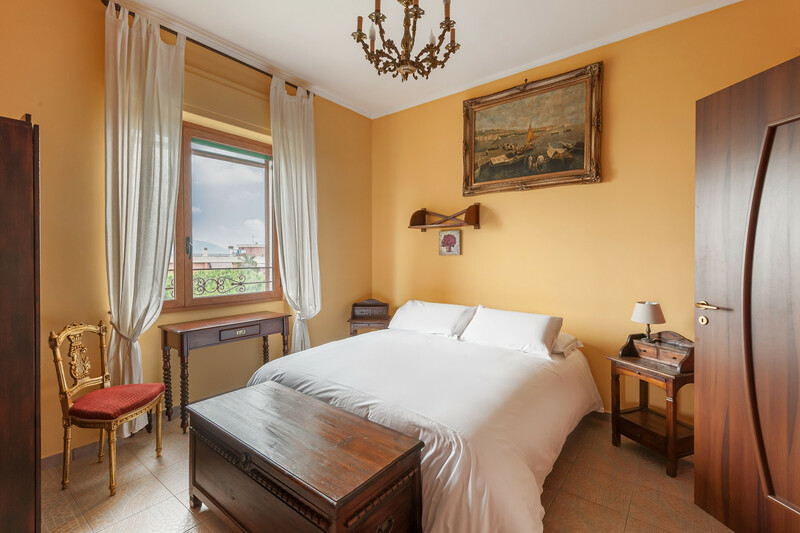 From here you can gaze to the blue waters of the Gulf of Naples. Relax on the white wicker chairs as you sip a drink and watch the world go by on the streets below. 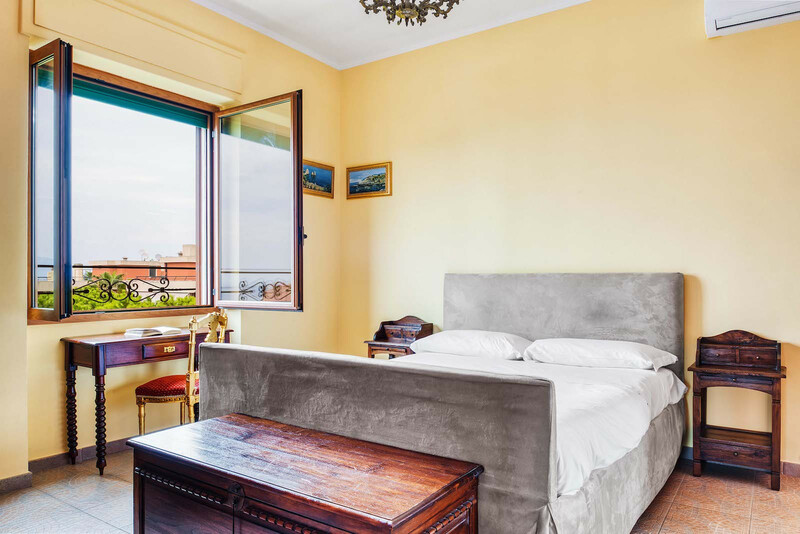 La Musica has three bedrooms. Two of these have double beds and one has two single beds. All have comfortable beds, with crisp white sheets. The wooden furniture is full of character, including an ottoman, console table and bureau-style bedside tables. There is air conditioning to ensure you have a comfortable night’s sleep. 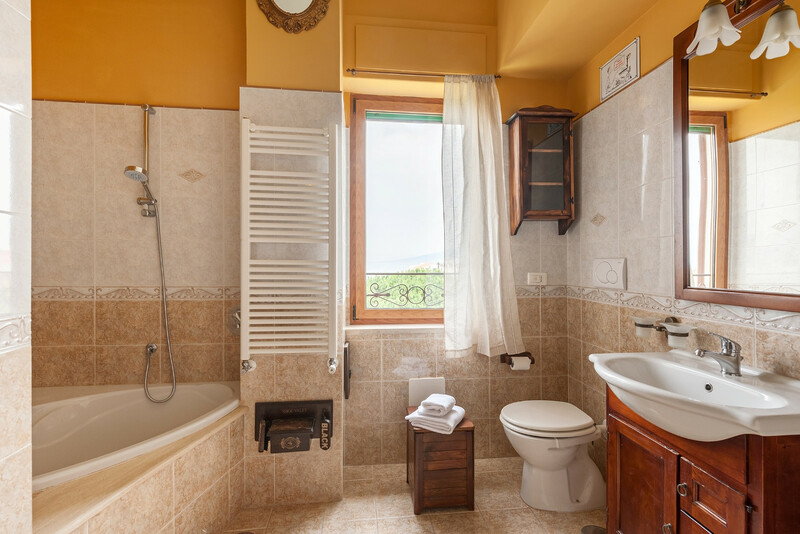 The master bathroom is very spacious, with a corner bathtub. The second bathroom has an enclosed shower cubicle. Both bathrooms have modern white suites. 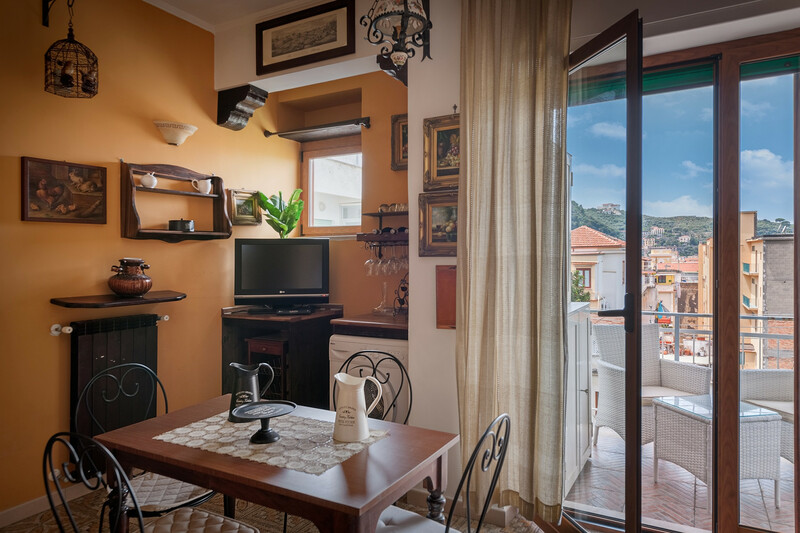 You won’t need a car for your stay at La Musica, as the location is very convenient for all transport links and the local sights. However, if you’d like to drive, just let us know and we can reserve a place for you in a nearby garage. 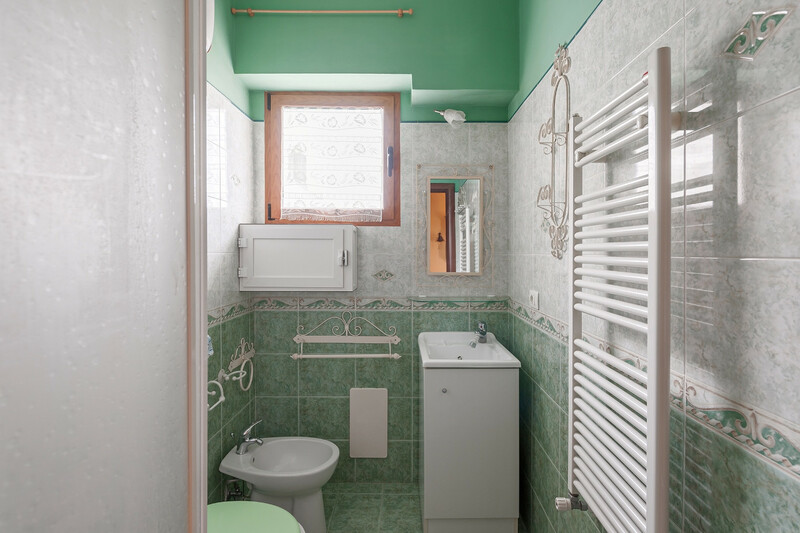 TV, 5rd floor, lift, 40 m² terrace, iron, internet (Wi-Fi), hair dryer, 120 m² property, air-conditioned. The views from the balcony were great. The host was amazing! We ended up being late because of some traffic. We described our rental van and he waited at an intersection on a scooter for who knows how long to help us navigate to the property and find parking after hours. The heater in the living room wasn't working but I'm guessing it was an easy fix and should be working for future guests. The apartment was beautiful....exactly as pictured! It was very clean, spacious and well-equipped and the balconies were amazing!! The location was phenomenal!!! On the main street, close to everything, yet very quiet. Tons of restaurants and shopping nearby with a grocery store across the street. 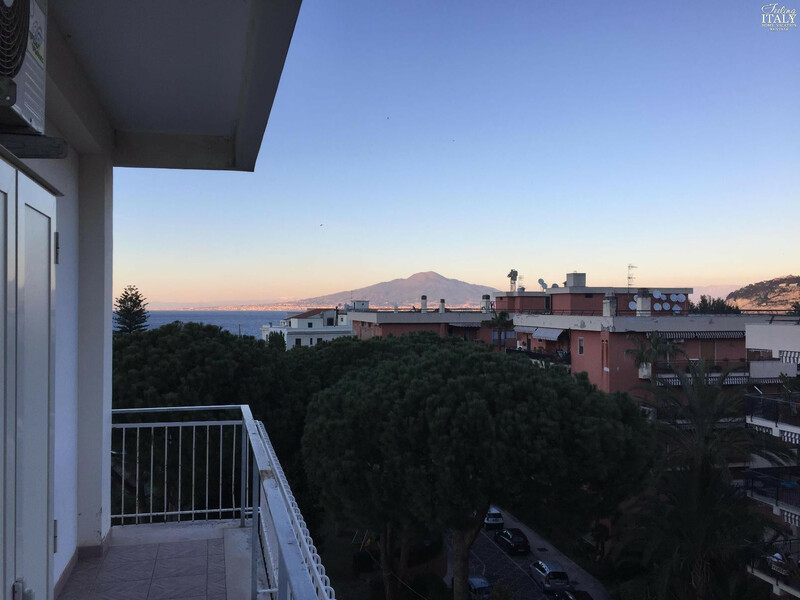 Two minute walk to train station and very short walk to the sea/ ferries making excursions to Pompeii, Naples and Capri seamless. Our host, Gianluca was fantastic! He met us immediately upon arrival and provided us with a great overview of the local area. In addition, he was easily accessible throughout our stay. Thanks Gianluca!! We can't wait to come back! !